Shigeru Ban: Humanitarian Architecture Dallas Center for Architecture 1909 Woodall Rodgers Freeway Dallas, Texas Through April 25 The Dallas Center for Architecture is presenting a selection of Pritzker Prize winning architect Shigeru Ban’s disaster relief designs. Ban’s humanitarian architecture has confronted some of the world’s most devastating natural and manmade cataclysms in the last 20 years. The Japanese architect is known for his pioneering designs for United Nations refugee shelters in the mid-1990s, using inexpensive and often recycled materials such as paper tubes and cardboard to make durable, shock-proof structures. 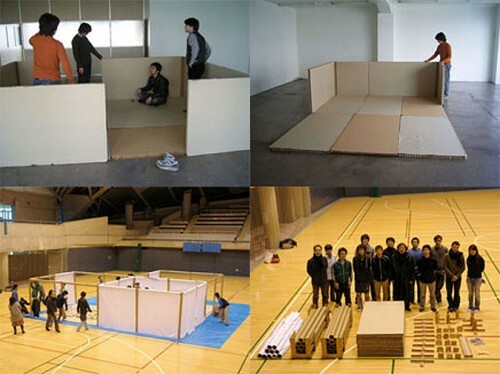 Projects on view include the Tsunami Reconstruction Project (2005, Sri Lanka), Onagawa Community Center (2011, Onagawa, Japan, pictured above), Cardboard Cathedral (2013, New Zealand), and Paper Nursery School (2014, Yaan, Japan). Complementing the exhibition is a film screening on April 8 of a 2006 documentary about Ban, Shigeru Ban: An Architect for Emergencies. 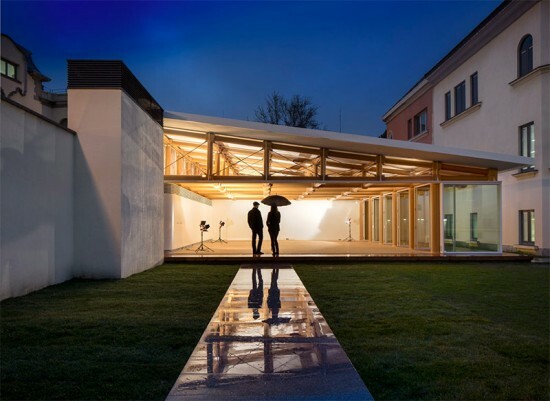 The film features extensive interviews with the architect about the practical, philosophical, and aesthetic aspects of his work. The exhibition is held in collaboration with Austin College, which will present Ban with the 2015 Posey Leadership Award at the Perot Museum of Nature and Science on March 26. In the summer of 2013, Mt. Fuji was named a UNESCO World Heritage site. The designation was of the cultural rather than the natural variety, in part because of the way the mountain has "inspired artists and poets." Japanese architect Shigeru Ban plans to add a quite literal architectural chapter to this legacy of inspiration in the form of a visitor center commemorating the mountain's recently-minted status. Ban's design takes Fuji's iconic silhouette as its centerpiece and then inverts it, generating an upside-down lattice cone surrounded by a 46,000-square-foot glass cube. The building is set to be located in Shizuoka prefecture of Japan and will offer views of the nearby mountain. 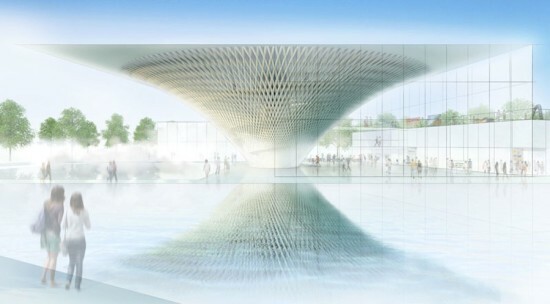 A surrounding pool of water reflects the structure's central cone, restoring the right-side up vision of its formal source material. A committee lead by the Ohara Museum of Art selected Ban's plan ahead of 238 competing entries for the project. Construction on the $23.5 million structure will begin in 2015. 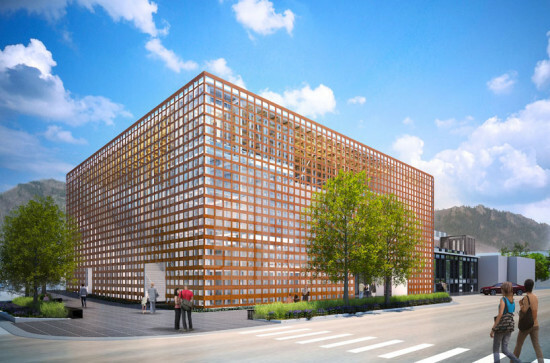 For those traveling the architecture/museum circuit, one of the next important excursions is definitely Shigeru Ban's Aspen Art Museum, which will open in August. Located in the city's downtown core, this will be Ban's first U.S. Museum. 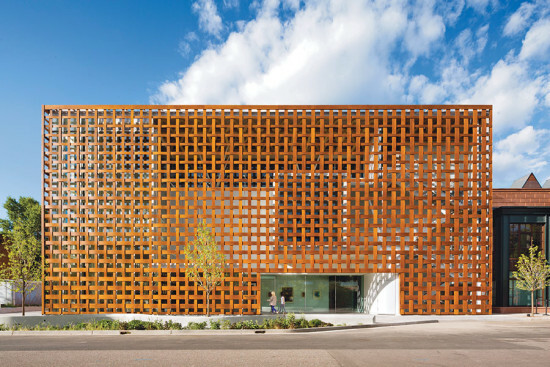 The building's gridded composite facade allows for open views inside, inviting people inside and filling the interior (including 14-foot-tall galleries) with natural light. Inside a three-level grand staircase ascends past two ground floor galleries, sandwiched between the exterior grid and the interior structure. Art will be displayed here on mobile pedestals.Around this spine the museum's Tetris-like design will be punctuated with complex but rectilinear geometries, "walkable skylights," a tube-frame roof structure, a large glass elevator, and several unique galleries. On top a roof deck sculpture garden will provide uninterrupted views of the city and of the nearby mountains while also showcase exhibitions and contain a cafe, bar, and outdoor screening space. The museum's several inaugural exhibitions will include a show on Ban Himself, Shigeru Ban: Humanitarian Architecture, with four full-scale examples of the architect's designs for disaster relief. 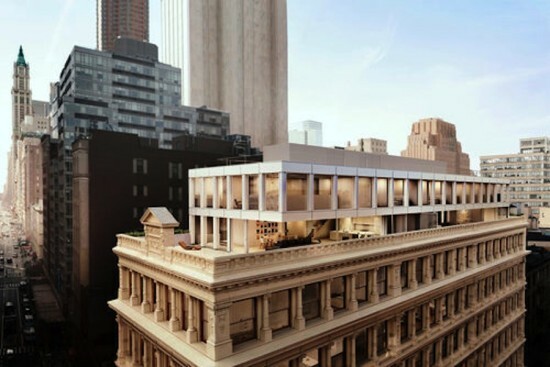 Renderings for Shigeru Ban's rooftop addition to a landmark Tribeca building have been revealed. Newly recast as a luxury residential space, the 132-year old cast-iron building located at 67 Franklin Street at Broadway is set to receive a new metal-and-glass-clad cap. This twin duplex penthouse will be joined by a revamped interior also designed by the Japanese architect. The existing structure will be filled by 11 duplex apartments. Since purchasing the space in 2002, Knightsbridge Properties president Jordan Krauss undertook a three-year effort to restore the cast-iron details that are the distinctive feature of the building. Ban was recruited in order to add modifications that would "work in harmonious dialogue with the existing structure." The penthouse he envisioned in response to this task will feature a Vierendeel truss (invented by this man) that will allow for first-floor glass doors to be opened up entirely, thus creating uninterrupted expanses between interiors and surrounding terraces. While images have yet to be released, the new design for the interior is said to feature extensive amounts of white lacquer and a bamboo-filled garden courtyard. In 2012 Ban pitched his plans for an addition to an adoring Landmarks Preservation Commission, with one panel-member gushing that the proposal was breathtaking. While the recently revealed renderings may or may not produce quite that kind of reaction today, the apartments they represent are expected to demand prices in the $12 to 15 million range. The Ban design may soon be joined by a number of other projects slated to adorn historic Manhattan rooftops. As a result of a devastating earthquake in February 2011, New Zealand's Christchurch Cathedral was left critically damaged. 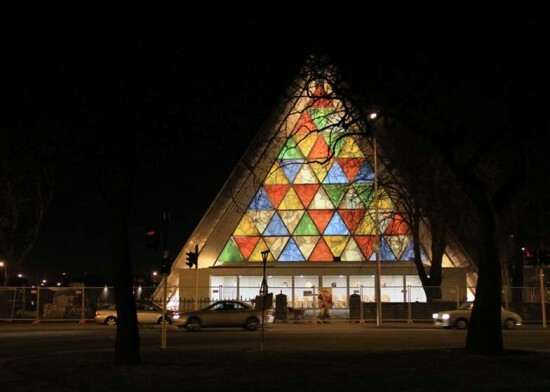 After an inconclusive debate about whether to completely tear down, restore, or remodel the original Neo-Gothic cathedral, the people of Christchurch were struck with what might be divine inspiration in the form of a temporary home, the world’s only cathedral constructed extensively of cardboard. 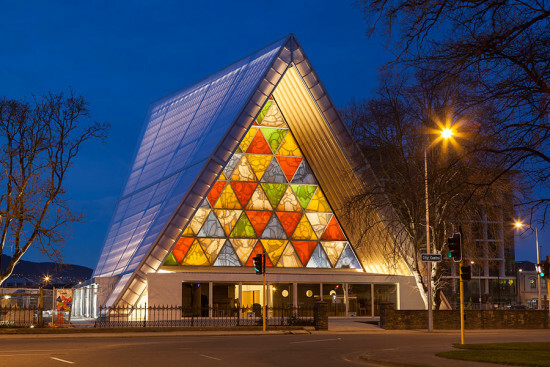 Tourism New Zealand announced the inauguration of Cardboard Cathedral, a replica of the original church constructed of cardboard tubes, timber joints, steel, and concrete. 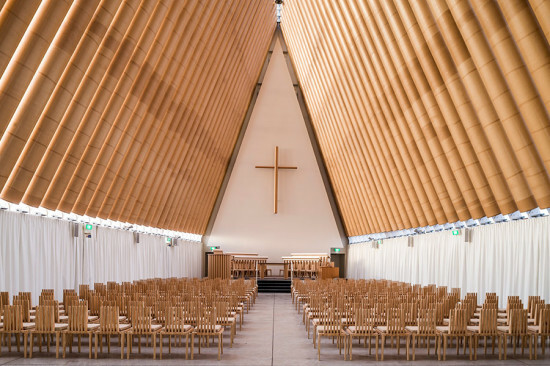 Shigeru Ban, a Japanese architect and a leader in "Emergency Architecture,” designed the transitional church as a testimony to the city’s resourcefulness and resolve following the earthquake and aftershocks. The structure involves a triangular profile constructed from 98 cardboard tubes surrounding a colored triangular glass window in the great hall that features images from the original façade’s rose window, which collapsed completely in December 2011. The main hall has a 700-person capacity for events and concerts. To further incorporate recyclable materials, the temporary cathedral also includes eight steel shipping containers that house the chapels. Designed to last for at least the next two decades, Cardboard Cathedral will remain in place while the original cathedral’s fate is determined. Recently, the rebuilding of the damaged cathedral has been a controversial topic, as critics have already shot down two contemporary designs, deeming them “bizarre” and “architecturally illiterate,” and have called for the building to be restored to its gothic form, originally designed by George Gilbert Scott in the latter half of the 19th Century. Projected to open in December of last year, the Cardboard Cathedral was subject to a sequence of construction delays and was not officially opened until last week. To celebrate the opening of the cathedral and its architectural splendor and acoustic potential, Joyfully Un-Munted, a concert series of opera, jazz and traditional music is being held through August 15, 2013. The latest Shigeru Ban paper tube building has opened at IE University in Madrid, Spain. Elsewhere, Ban built the paper tube Nomadic Museum in New York City on a Hudson River pier in 2007, a Camper retail store in New York's Soho neighborhood, and now in Christchurch, New Zealand he is constructing an A-Frame cathedral out of the temporary, eminently efficient material. The Madrid University building took only two weeks to build, is based on sustainability objectives, and there was a requirement that it be a temporary construction. It is made of 173 paper tubes held together by timber joints that rest on paper columns. “One of the main challenges in any project is that the design must take into consideration the specific characteristics of the location. In this case, we used an existing wall and kept the pavilion as far as possible from the adjacent building,” Shigeru Ban said in a statement. “I try to use local firms for my work. In this case the tubes, for example, were made in Zaragoza.” Shigeru Ban also pointed out that students from IE School of Architecture took part in assembling the paper tubes, and underscored how important it was as an educational experience for them. Shigeru Ban's Tokyo office is developing temporary housing structures for those displaced by the natural disaster in Japan, reports Archinect; click here to help support the project. Stateside, AIA president Clark Manus issues a statement encouraging U.S. architects to do all they can to support Japanese recovery efforts. The New York Times covers Forest City Ratner's plan to use prefab building components for a 34-story apartment building at Atlantic Yards in Brooklyn. 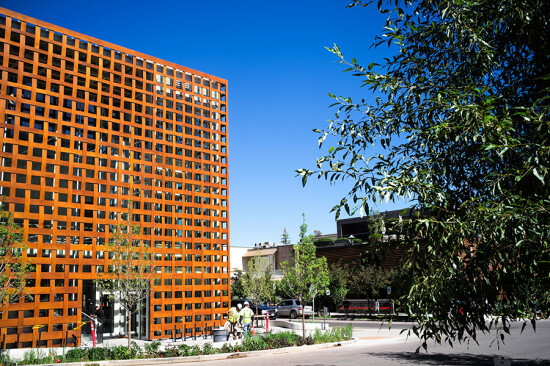 Engineered by Arup and designed by SHoP, the units should be pretty high-end as far as modular housing goes, but construction workers argue that the prefab approach will mean less jobs. The Frank Lloyd Wright Building Conservancy trumpets the news that twelve of the master's houses are currently on the market (starting at $800k for the Arnold and Lora Jackson House in Beaver Dam, WI), via Design Crave. Acorn Media announces that the acclaimed BBC "Genius of Design" series is available on DVD. The five part documentary focuses on the highlights of industrial design throughout the twentieth century and beyond. If you happen to be a fan of Kurt Anderson's wonderful radio show Studio 360, perhaps you tuned in this weekend for the trip to Japan, a fascinating account of a place that seems at once otherworldly and yet so much like our own. If not, dare we suggest you tune in for the whole hour. Or, at the very least, consider the wonderful segment on Japanese design. In it, Anderson interviews architectural master Shigeru Ban and the up-and-coming couple behind Atelier Bow-Wow, as well as a fashion designer and a poet. At issue is that undeniable "Japanese-ness" that undergirds their work and that of their country, how it is shaped by their tiny, overcrowded island and, more recently and perhaps importantly, the economic collapse of the 1990s. How Much Is That Building Really Worth To You?